International Protective Service, Inc. (IPS) offers the highest level of private security with armed patrol and standing guard officers. The capability to use deadly force is not something we take lightly at IPS. In order for our officers to be armed guards (Level III certified in New Mexico), they must prove they have the knowledge, temperament and skill it takes to know when and how that force may be applied. These training requirements are for the officers who have successfully passed our six-part hiring process that includes a background check into a candidate’s personal, professional and financial standing. 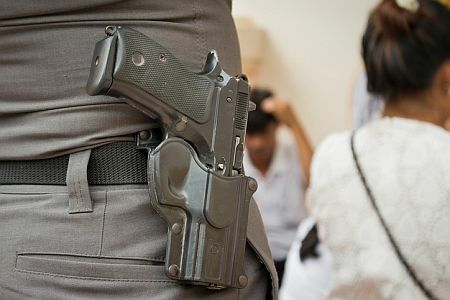 Commercial patrol services are almost exclusively provided by armed officers because there is no way to predict what situations may arise during patrols. When it comes to standing guard duties, you may have an option between an armed or unarmed guard. However, there are some commercial facilities and/or situations when IPS will recommend (and may require) an armed standing guard if our free security assessment indicates heightened security risk. Contact us to enhance security at your commercial facility with armed standing guards and patrols.